9 June 2017 – In order to reflect on the 26th Session of the Commission on Crime Prevention and Criminal Justice (CCPCJ) and to exchange information on the preparations for the 14th Crime Congress, an informal dialogue took place recently in Vienna. 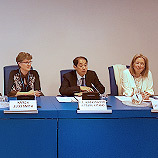 At a meeting with non-governmental organizations (NGOs), the Chair of the Commission and the Permanent Representative of Japan to the United Nations in Vienna, Mitsuru Kitano, acknowledged their role in promoting and supporting comprehensive and interdisciplinary approaches to crime challenges. Welcoming the active participation of civil society organizations in the CCPCJ, he stressed the importance of strengthening informal dialogue with them ahead of the 14th Crime Congress, which will take place in 2020 in Japan. Equally important is to continue liaising with other stakeholders during the preparation period. Also at the meeting, he informed that Member States are now working on the Congress’ agenda items and workshop topics. With a view to integrating crime prevention and criminal justice in the 2030 Agenda for Sustainable Development, the theme of the next Congress has been selected as “Advancing crime prevention, criminal justice and the rule of law: towards the achievement of the 2030 Agenda”. The Crime Congress will cover areas, including evidence-based crime prevention, identification of risks and developing solutions, education and youth engagement, and current crime trends, recent developments and emerging solutions, in particular new technologies as means for and tools against crime. Particularly relevant to civil society are the comprehensive strategies for crime prevention towards social and economic development and the integrated approaches to challenges facing the criminal justice system.